I know what some of you must be thinking. How could my three year old still have cradle cap? Have I not been taking proper care of her? Isn’t it supposed to disappear on it’s own, anyways? Well, I would love if that last query were true. That’s what I was banking on for the last couple years, after coming to terms with the fact that the scaly yellow flakes covering my daughter’s scalp just weren’t going to go away despite the washing and scrubbing and picking. That first year I tried as best I could to clear up the cradle cap. But when it wasn’t working, I had to leave it alone for a while. The scrubbing and picking at my little darling’s head was not bringing us closer together, and I began to worry that I may be doing more harm than good, picking away at the crusties and leaving her head looking red and uncomfortable where I’d been grooming. Though cradle cap is hard to capture on camera, you can make out some yellowish scales in some of Z’s baby photos like this one. So I stopped. And although I had read in multiple places that this condition would eventually clear up on it’s own as my daughter got older, it didn’t. While her hair grew, I would still catch glimpses of her cradle cap through her fine, blonde hair. Now that her hair has grown long enough to put up in different styles, the yellow scales were even more clearly seen, detracting from the adorable braids and dainty little pony tails. Maybe it wasn’t as obvious to others as it was to me, but in my view it was glaringly obvious. Also, my daughter would scratch at her head from time to time, which (after ensuring she hadn’t caught lice) I chalked it up to those yellow flakes. Was the cradle cap itchy? Was it bothering her? Clearly, something needed to be done again. Before you can take care of a problem, you should be familiar with it. 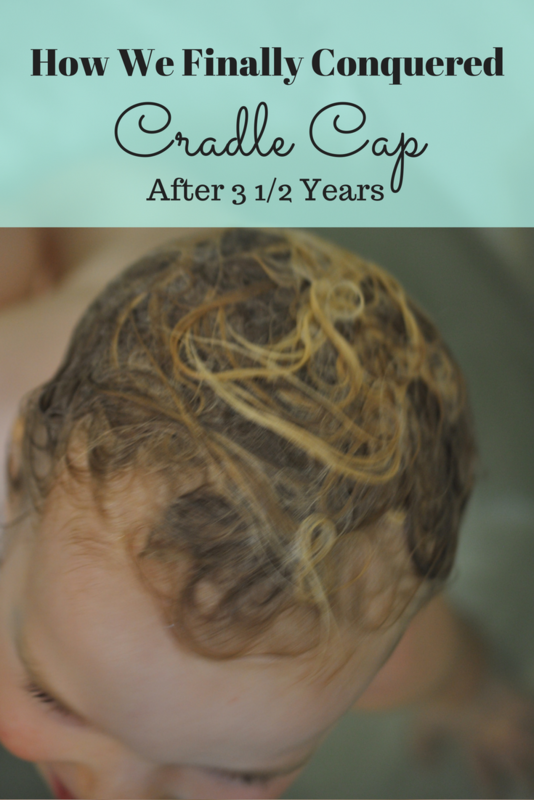 So here’s what I’ve learned about cradle cap. Cradle Cap (also called seborrheic dermatitis) is a condition where crusty or oily, scaly yellowish patches appear on your baby’s scalp. This skin condition appears in the first weeks and months but is harmless. It will usually clear up on its own by the time a child has their first birthday (something that didn’t happen for us, unfortunately). Trying to get cradle cap on camera, especially with a very wiggly and playful three-year-old, is tough! Here’s the best I could do, to give you a bit of an idea. The true cause of cradle cap isn’t entirely clear, but professionals are certain that is not caused by allergy, bacterial infection, or bad hygiene. One of the considered causes is that glands in your skin (sebaceous glands) may be over-actively producing sebum, an oil-like substance. When the glands produce too much sebum, this might prevent old skin cells from drying and falling off the scalp as they usually would, so they stick to the scalp. If you’re eager to get rid of your little one’s cradle cap, you can help it along by rubbing a small amount of baby oil or petroleum jelly into the scaly area an hour before bath time. Before the bath, wet baby’s scalp and scrub the scaly areas gently with a soft toothbrush for a few minutes. Wash with baby shampoo and rinse well. Gently dry with a towel. Bath time! Here’s another tip: Goggles in the bathtub make for a fun way to keep suds out of those sensitive eyes. I have to admit, I only tried using oil on her scalp a handful of times, at the suggestion of my mama group friends. Aside from my daughter looking like she stepped out of a scene in grease, not much else seemed different. What did I do wrong? Some things I could think of were that I had used coconut oil instead of baby oil, being the natural-living person that I am, and as much as I hate to say so, my “wonder oil” (honestly, I use it for everything) just didn’t seem to be doing the trick. Determined to be done with cradle cap once and for all, I decided to get back to work and to try something new. Instead of trying coconut oil again, I was curious to see what would happen if I gave Cetaphil Baby Moisturizing Oil a try. Made with organic calendula, sweet almond, and sunflower oils, this baby oil is free of parabens, colourants and mineral oil (as are all the Cetaphil Baby products). The products are hypoallergenic and are recommended by dermatologists, pediatricians and other mamas, so I decided to give it a shot. Something had to work. So thus began our new bedtime routine. About an hour before bedtime (if I can remember that early – sometimes it’s less), I bring down the bottle of Cetaphil Baby Moisturizing Oil, and start to give my three-year-old a “head massage”. This was not a hard sell, and she seems to enjoy having me gently rub the oil into her scalp. 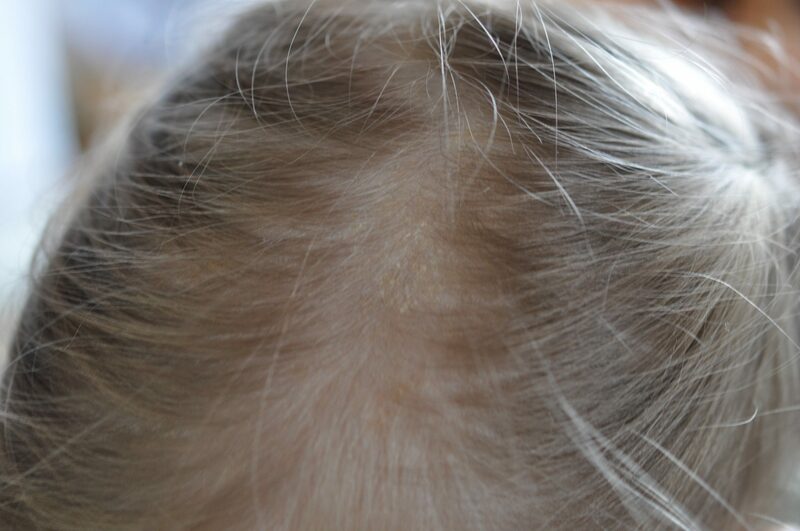 I focus on the areas where the cradle cap is, spreading any extra oil around the rest of her scalp. I have even been using this as an opportunity to moisturize her very fine hair, hoping that this helps to keep it from tangling if so much as a breeze touches it. Why not, right? All oiled up and ready to conquer that cradle cap! Next comes bath time, which my little Z has enjoyed me being part of. As her Dad has always been the one in charge of the bedtime routine, just having me be a big part of it was a change in it’s own, and a happy one at that. Sure, her father could be the one washing a scrubbing while I clean up from dinner (and he usually does get her started, still), but I have been enjoying spending this time with her for a change. There is something so bonding in the act of physically caring for your child. As I lather her hair with shampoo, and we rinse it off together, I am confirming for her that I love and care about her well-being. Yes, I show her this in many other ways throughout the day as well, but somehow this feels even more special. The difference between how easy it was to remove the cradle cap when I was using coconut oil, compared to using Cetaphil Baby Moisturizing Oil, was phenomenal. Instead of feeling like I was picking scabs, it felt more like wiping away butter. Seriously, I was blown away by how much more gently I could be as I scrubbed. The first night I tried this, I noticed a big difference in her scalp. I was able to get all the cradle cap I could find to come off! That has never happened before. No matter how hard I tried to get it gone, it had never completely come off in a scrubbing and picking session. Even better, it has stayed away for the most part. After a week of enjoying our new bath routine (only oiling shampooing every other day), my daughter’s scalp finally looks clean and healthy. After 3.5 years of dealing with the scaly, oily, yellow patches on my little one’s scalp, I’ve finally found a method that works to remove cradle cap. If this is something you’ve been dealing with yourselves, I hope this post has been useful to you, and that you and your child (whether baby, toddler, or preschooler) can conquer cradle cap, too. Good luck! Disclosure: This post is part of the YummyMummyClub.ca and Cetaphil Baby’s #CetaphilBaby sponsored program. I received compensation as a thank you for my participation. This post reflects my personal opinion and our experience of the Cetaphil Baby Moisturizing Oil. You can read my full disclosure policy here. I am mom to 3 boys, the eldest turning 14 in just a few days, then there is my very busy 8 year old and our youngest little man is 4! I turned to the internet in search of cradle cap remedies, and that is how I came across your post. All of my sons had a very mild cradle cap as babies, which lasted maybe 2 weeks and wasn’t really a problem. We have the same routine as you do – it is daddy’s time with the little ones during bath time. Last night I decided to bath the 4 year old, just to have some special playtime with him, seeing as I had very little time for him during the day. When I blow dried his hair afterwards (it is very cold still in South Africa) I saw these yellow patches on his scalp. It is not flaky at all, but it looks sticky and greasy, until I scratched at it and realized it is actually dry. It does not come off easily. It kind of reminded me of the cradle cap they had as tiny babies, except for not being flaky. I am blown away, as he is 4 years 4 months old already! I really never knew you could get it when you are older. Assuming that is what it is……he doesn’t scratch at his head, so it is not itchy. There is no redish marks or anything. His hair isn’t oily or dry, he doesn’t even have dandruff……just the smallish yellow spots all over the top of his head……they seem kind of circular, don’t know if that means anything. I am sure you looked into other reasons for this too – could you find anything? I couldn’t, but I actually only started my search this morning. We do have Cetaphil products here in South Africa, so I will go and look for the oil and will definitely try it out in the mean time. Luckily for me my son has a very full head of lovely straight blonde hair, so nobody will see it, unless they actually come close and part the hair to look at his scalp, but I don’t want it to be there……I am sure you know the feeling. Thank you for the opportunity to just speak openly about it. I almost freaked out last night….then I calmed down and started to look for any signs of “illness” and even lice, hahaha! If you have any more information for me, I would really appreciate it. Hello Mariette! I am quite certain what my daughter was dealing with was cradle cap. It had been ongoing since she was a small baby (and will come back ever so slightly, even still) and looked the same as all the babes I have seen since with the same issue. It seems very common. The oil routine really does work well for my girl. Good luck! It can be such a silly hassle. And if you’re not confident about what it is you’re seeing, I would seek out a doctor’s opinion (which I certainly am not). Thank you for posting pictures! I noticed a couple months ago that my toddler (now 2 years 8 months) had these little discolores patches on certain spots on his scalp. Like it was only after I started scratching (gently of course!) and then used a bit of coconut oil (thinking it might be cradle cap) that I realized it was all over the top of his head. Doesn’t really go down by his ears or on the back/neck part…but certainly where a baseball cap would cover. Today I actually sat him down and using coconut oil, spent a decent amount of time loosening the tiny pieces…which the only frustration was that even with the finest tooth comb I had…the flakes would stay mostly on his hair strands. Makes me wanna get a lice comb to see if that would assist with getting it off his hair strands. Anyways, thank you for posting the pictures because it looks quite similar to what my son has but anytime you type in toddler cradle cap it’s like the worst case scenarios and that always made me feel like maybe it’s not what he has. So thank you! I’m so glad I helped you feel better, Stephanie! As noted on this post, I’m no doctor, so I can’t be reliable for diagnosing. But I agree, it sure feels nice to feel like you’re not alone and there are other possibilities than the worst case scenarios. I’ve been down that stressful searchengine spiral before many times. There’s a lot of worst case scenarios on the internet. Good luck with the cradle cap! My Z is almost 5 now and I still find a bit now and then. Just another thing to add to the “Am I taking care of my child properly?” list of things to apire to/feel guilty about, right?